Our natural stone comes in many different thickness. 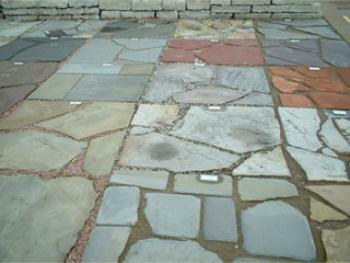 The main difference between flagstone, steppers and wallstone is their thickness. FLAGSTONE: thickness from 1"-2 1/2", used for walkways, paths, walls and waterfalls. STEPPERS: thickness from 1/2"-1 1/2", used for walkways, paths, walls and waterfalls. WALLSTONE: thickness ranges from 2"-4", used for walls, waterfalls and ponds. pick through the pallets to get the exact size and type of natural stone you need for your project. Stop in so we can help you with your project. We have all of our flag and wallstone materials on display. Please stop by our showroom to see the natural stone in person. Use the pictures as a reference only. FLAGSTONE: thickness from 1" - 2 1/2", used for walkways, walls & waterfalls. STEPPERS: thickness from 1/2" - 1 1/2", used for walkways, walls & waterfalls.